So... it kinda looks like the old thread was purged off the face of these boards. Time to start over? RG Skygrasper + Launcher and Sword Striker, plus web-shop exclusive Strike Phase-Shift Down colours. MG Duel Gundam Assault Shroud! Now that's a biggie. If they're going for Duel, there's almost no way they're going to stop at just that one. So it's a very high likelihood that we're getting MGs of all 5 GAT-X Gundams (well, 4 remaining. Unless they do a Strike 2.0 or something. Duel's frame does look a bit different than the Strike's...), which is huge. Also, MG Blu Duel suddenly becomes a very possible reality, and that has me extremely excited. MG Gundam AGE-1, due in February, with MG Titus and Spallow following closely in March and April respectively, and MG Gafran following after them in May. Edited by mx-01 archon, 18 May 2016 - 01:46 AM. Well there goes my money. It's hard to resist Duel Assault Shroud. Is that LaGOWE an all-new mould or just a BuCUE with new parts? I might get it, since I'm pretty fond of SEED's dog MS. I probably won't, 'cos I have enough of a backlog (not so much in quantity as it is relative to how slowly I've been building) as it is, but still... it's nice. Also, the beta for the english version of SD Gundam Capsule Fighter has started, and it's a pretty fun game. It's in closed beta at the moment, but there's plenty of places to get keys (I got mine from their page on Facebook). Edited by Amadeus Windfall, 04 November 2011 - 02:30 PM. Duel w/ Assault Shroud is getting a Robot Damashii too. That's what I'm snagging. Yeah, we've seen the Buster and Duel Damashii awhile ago, now. Of course, Bandai has a habit of revealing all sorts of goodies that don't come out anytime soon with that line (and its sister S.H.Figuarts and D-Arts lines). I'm also very excited for the high possibility of an MG Aegis. It's a unique and fantastic Gundam design, but the lightweight construction of the HG models tended to leave it rather floppy and unstable. A nice solid internal frame would do that design wonders, especially with some of the typical BEECraft styling to sharpen it up. Looks to be mostly, or completely, new. Joint parts might be re-used, and the neck is similar, but everything else about the LaGowe is different, if only from an aesthetic standpoint. Edited by mx-01 archon, 04 November 2011 - 03:52 PM. Oh yeah, I got my MG Sandrock EW today. But I think I'll wait until tomorrow to start the build, I hate when I can't finish. I get to pick mine up tomorrow. Sandrock is easily my favourite of Katoki's Wing re-designs. He took the clunky and drab TV version, and turned it into something rather elegant. 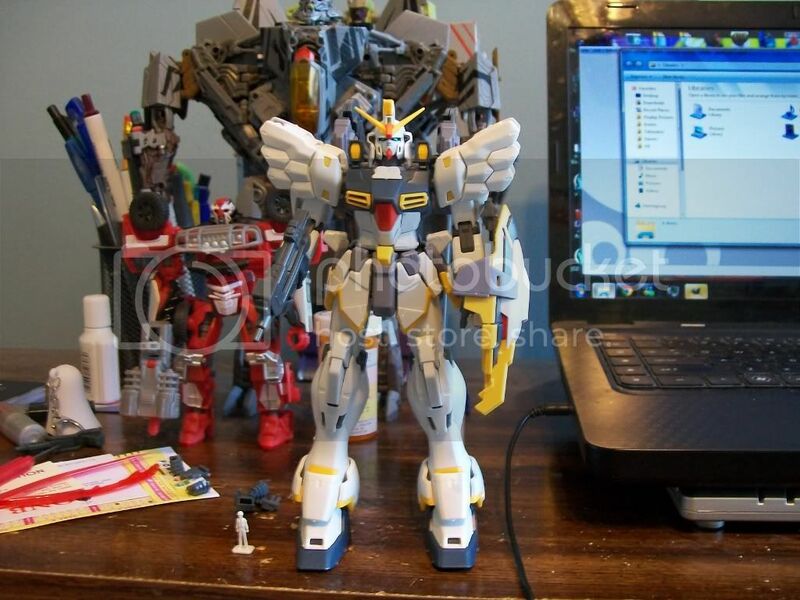 It's much better than the barely changed Deathscythe and Heavyarms, or changed for the worse Wing and Shenlong. Plus unless you really want the stupid cloak, this MG includes all your Sandrock related needs. Duel was always one of my favorites, so that's cool that it's getting a MG.
RG Skygrasper with the Launcher and Sword packs is great, especially since I'm thinking of buying Strike but was dreading the thought of them releasing 2 more of essentially the same kits. And they're re-releasing Strike without the Aile pack? Alright, I guess some people might want that. And a De-active Phase Shift kit? I personally don't see the point of that, but I've been looking at Marvel and DC statues lately and there always seems to be B&W exclusive versions, so I guess it's just something people like. I wish they would make a RG Strike Rouge all the customs I'm seen look great. Are all those 144 kits ones they're re-releasing? Because I must say I own the HG Freedom kit and it is not very good, especially with a RG coming out, I mean both Wing Zero HGs have better wing movement then it and they're 6-7 years older than it. But the LaGOWE looks really good, and Andy was a favorite of mine. And those are some nice customs on GundamGuy, Sazabi, Freedom and Strike are my favorites. They did the RG Strike Rouge. Was an exclusive a month or so ago, IIRC. I thought so, but couldn't find news on it, only customs. -Edit- Ah there we go, I searched on GundamGuy first and only got customs, GunJap has the news on it. Edited by Fenix Twilight, 05 November 2011 - 04:55 PM. RG Strike Rouge must be mine. I shall kill any who seek to deny me a unit of the limited stock. MG Duel- I have to be honest and say I was hoping for an RG but this could work too. Duel was one of the few cases of CE taking a chance, an ancestor Gundam that ZAFT had to do significant work to to make decent. Add in that Yzak had a good character arc and this is very welcome. Certainly more then redoing a Kira unit. RG Skygrasper- Not a complete surprise though I do have to admit the Strikers look fairly dissapointing. MG AGE/Gafran- Dissapointed because the plan for this makes it all sound like a delayed AGE 1/100 TV run line. Why not just do that from the start rather then the awkward Gageing Builders concept? And yes, I know the cynical reason. Legend BB- Not quite the fresh take I was hoping for but this could work. The idea of revisting solid ideas from past SD and giving them a modern update could work well if done right. Going for Knight, Musha and Commander at the start will at least have my money. I'll probably have to go back and fix some problem areas with part fitment, but for now I'm content just to have Sandrock built and on my desk. Well, Master Grades are Master Grades, they'd be made some time anyway so why not just do them during the series? The Gage-ing Builders line strikes me as a toyline rather than being models, so I don't see any conflict there, and a gradeless 1/100 kit line would seem kind of pointless from my point of view when there's already MGs for the size and HGs for the complexity. I haven't been following the franchise during any previous series' airing, since I really got into Gundam after the end of 00, but they seem to be handling it fine as far as I can tell. I'm quite happy by the new wave of plamo news, especially the SEED MG being the Duel, considering that suit totally rocks. also I had to glue RD wing zero's one hand onto the balljoint, it got to the point where it was not just unable to hold the gun, but the hand didn't even stay on. thankfully, the balljoint is on a swivel joint so the hand didn't lose much mobility. should I display/play with tallgeese 3's beam saber with the gun attached or removed? Edited by Ave Destron!, 05 November 2011 - 04:36 PM. Does anyone see City-Swimmer? Is he gliding beneath the silver water? Is he creeping 'round a corner, hugging a wall, silent as a shadow in the dark? The point of MGs is to be a high quality versions of designs which contain as many in story gimmicks as reasonably possible. How can you achieve this if you start making them whilst the show is still running? 00 didn't get a single MG until the show was over, with a special announcement for Exia after the final episode. If MG Exia had been made whilst the show was still running, would we have got something as cool as the Repair parts? If I buy an AGE MG, I don't want to come away feeling dissapointed because they left out something that would have been entirely possible had they waited a few months. There are tons of AGE-1s out there right now. Why not wait and really make the MG something special for fans to own to embody the iconic nature of the show? I'm sure bandai is fully aware of what gimmicks occur in the show. If they know it all, what's the point of hiring creative teams to make the shows? Some ideas only develop once the episode is in the can. I highly doubt every single idea for AGE is set in stone right now. They could always put any extra weapons and such in with the Titus and/or Sparrow; after all, you'd need to buy both of them to get AGE-1's gimmicks in full anyway. I can see where you're coming from, certainly, but I doubt it'll be much of a problem - especially since AGE-1 will (presumably) only be around for a third of the series.